Jetstar cancelled my flight to Tokyo two days ago, so I definitely had a sense of deja vu today travelling down to the Gold Coast from Brisbane. As it was now a Saturday, Kate was able to drive me down which sure beat getting the train and bus again. Upon arriving Kate dropped me off and I used the new self check-in kiosk to get my plane ticket. Kate then re-picked me up and we went and had brunch at a nearby cafe then went for a long walk along the beach. Upon boarding my flight I was pleased to find that my seat was an aisle seat only three rows back from the door. There were still around 24 other rows in front of me, mainly business and premium economy but this is the closest I've been to the front on a flight to Japan. 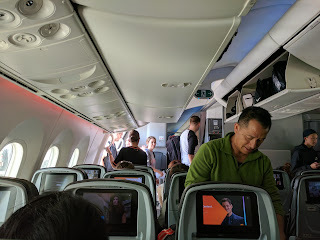 The flight was pretty uneventful, we took off a little late, but not too bad. I mainly studied Japanese using Anki, and listened to the Skeptics Guide to the Universe podcast. Total flight time from take off to touch down: 8 hours 27 minutes. Upon landing there was still another Jetstar plane at our gate so we had to wait for a little while. Time from touch down until I stepped off the plane: 24 minutes 27 seconds. After getting of the plane I hustled through immigration, customs, and then from terminal 3 to terminal 2 train station which is around 900m. Unfortunately as I had filled my disembarkation card out in pencil the immigration people made me redo it in pen. On the plane I had a pencil and a pen but I thought if pencil is good enough for an election, it's good enough for my details. Apparently not, has to be blue or black pen. This cost me around 5 minutes. Time from stepping off the plane to arriving at Narita Terminal 2 train station: 23 minutes 27 seconds. Upon arriving at the train station I put 10000 yen on my Suica card, then went to the Keisei ticket counter and reserved a seat on the next Sky Liner. Once I found my plane was cancelled though I rang the hotel and they were happy to hold my items for me until I could pick them up on Saturday. Thank you very much Toyoko Inn Akiba Asakusabashi Eki Higashi Guchi! This meant however I was in quite a hurray as I had to make my way from Narita to Asakusabashi, to the hotel, then out to my AirBnB in Nerima which is another 55 minutes away. I also had to arrive by 10pm as that was a latest I could check in- earlier the better though so I didn't keep my hosts awake. After a lot of rushing around I managed to make it! 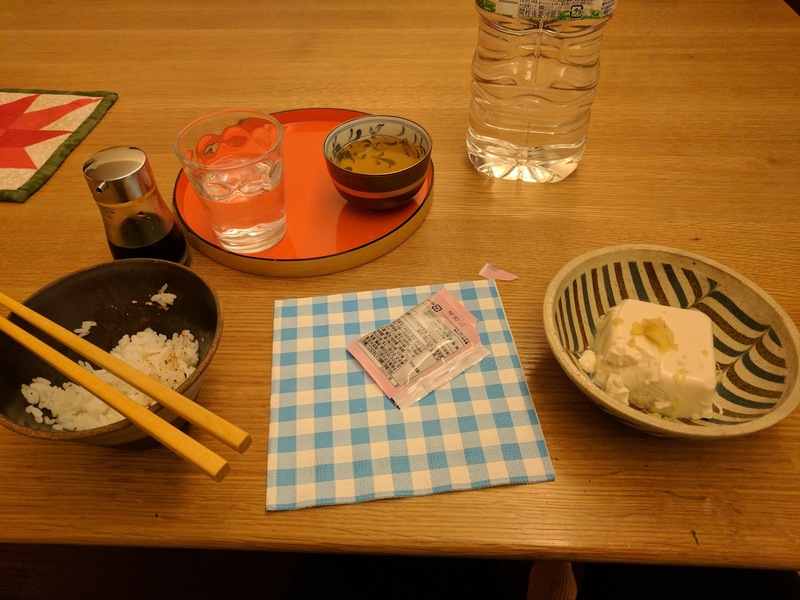 I arrived pretty hungry and was very happy when my hosts provided me some rice and tofu! After that I had a shower then crashed to sleep. Tomorrow I'll be seeing my first cherry blossoms and visiting Chidorigafuchi, Yasukuni shrine and Shinjuku Park.